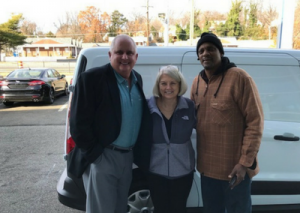 Good Shepherd Housing has bought its first maintenance van which was made possible by donations from GSH Board Member Mike Bennett and Ourisman Automotive of Virginia. Since GSH first started purchasing housing units, we have relied on our maintenance man to use his own van (we paid mileage of course). While this has worked over the years, as we have grown, it has become increasingly inefficient to be dependent on someone else’s vehicle. Good Shepherd Housing will own 63 units as of December 19th. Having our own maintenance van will give us more flexibility and lower monthly costs. And – it will be a beautiful, shiny white billboard for Good Shepherd Housing! Thank you Mike and Ourisman!